The Beatles: Rock Band was at the center of attention as event goers cycled in and out of the different positions in the band. All the new instruments were on display, and while the drums didn't look all that different the guitars really stood out in both style and size. I got to play the long neck bass, which felt really solid in my hands. 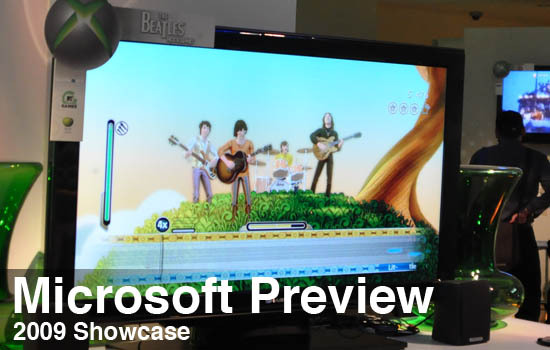 The game itself was as familiar as the previous Rock Band titles, but is over loaded with plenty of Beatles style. People were actually singing using the wireless Lips microphones, and at one point I believe there were three separate people singing the same lines in harmony. I honestly think this game will be a bigger party game than any of the other music games, simply because people relate and know almost all of these songs. Whether it's from TV commercials, movies, or radio I didn't hear a song played that I didn't know from the great band. There's not much to say about EA's upcoming Madden title. I found out the online co-op mode is relegated to only single games - there's no way to play a career or franchise online. And while it's limited to only two players, EA is looking to bring the action to around six concurrent players. The reason? Who wants to do blocking patterns in a video game? Graphically the game looked really slick, and there were a few new animations that stood out to me. One nice touch was on a fumble the game starts a scrum, and you'll need to time button presses to successfully collect the ball. Overall it should be another solid football title. Page created in 0.7701 seconds.